Abstract design with light refracting bevels using complimentary color and texture of aqua, burgundy and clear to make up this rectangle entry door window. 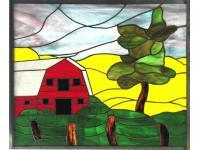 Red barn with grain field in the background and fenced yard in front of this window panel rectangle. 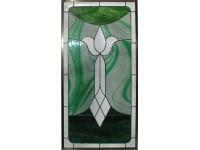 A modified design from Chantal's Stained Glass Patterns. 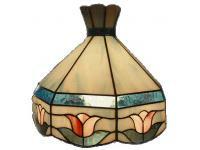 Pink tulips at the base of each panel set in white opalescent glass with blue accents in this lamp. Complete with swag hardware. Bevels surrounded by green baroque and green streaky glass. 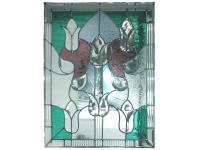 It is then framed with bevels to refract the sun light into a rainbow of color in the west window that will be its home.